Zombies Vs Plants, in some way. Here are my 'last-minute' entries for round two of The Inhabitant: a titanized version of 'Dust' and a Haryon, the Tree of Madness. The backstory can be read here! Species: Unknown (rumored to be Bukgu). Ocupation: Agent of the Order of Mata Nui. Power: Flight, Dust and toxins creation. 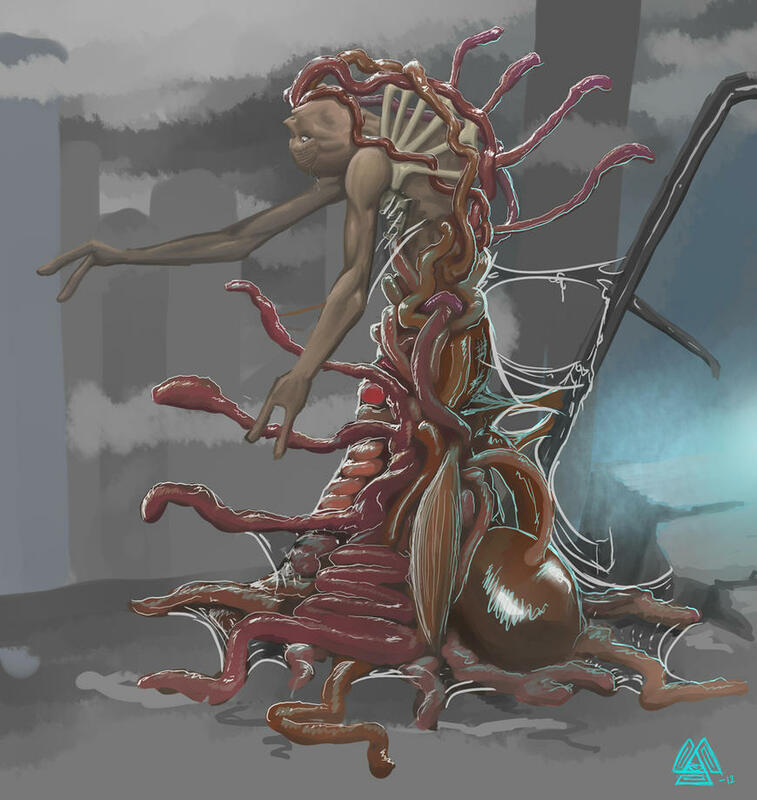 Personality: At some point in the past, Daure was caught and converted into a biohazard living weapon by an unknown group of scientifics. This alternative version of him was succesfully completed as a weapon, and now he does every mission he's assigned to without questions. Like the 'original' one, he isn't very communicative. Mask: Kori, Mask Of Disgregation. Allows the user to divide his body into small particles, controlling everyone of them, and regroup again. 'Dust''s one was fused to his body and adapted as a gas mask. Character Song: Futari No Harmony (Our Harmony) -duet with Sellur-. Click here for the old version of 'Dust'!! Tadaaaaaaaaaa!! First entry, a revamp of probably the most suitable MOC for this challenge, 'Dust'! Upper legs and waist. I run out of ideas and parts for upper legs, yes. But I think I managed to do it well. Torso. Maybe a bit bulky, but I love it. Since I got Stormer XL I wanted to use his feet for a jacket. A hidden Heartlight (dark-green jewel), a excuse for put the MOC in the famous group HEARTLIGHTS FTW!!! The mask. For me, the second best part of this MOC. I upgraded the design and I added some tubes, as you can see, and for a comment from Gringat, I make the eyes more... visible. Pollution Ejectors. The same from the original, but adapted to this version. Love this weapon; third best thing here. Upper arm. I one of them I kept the stickers from Melty. They fit the character somehow. And now, the best part of him... THE BACK!! Now some action poses, as always. Don't worry, I'll be fast. Sellur: 'DUST'!? It's that you!? Turaga Lianyu: My, my. Isn't this little boy our old friend? Sellur: Yes, Master. It's our comrade Daure! Well, let's leave these friends talk a while, while I'll introduce you the second entry of the contest. "Behold the power of Madness, my friend. It can turn the sweetiest trill into a horrible scream, and the most pure tree into the most disgusting predator"
Titles: Haryon, Tree Of Madness. Personality: Like the Kiryoki, the Haryon have a strange, erratic and aleatory behaviour. Unlike the birds, they are insatiable predators which want to kill and devour everything alive. Secundary Weapon: Roots, Horns, Spikes. Theme Song: Tree Of The Dead. I don't know why, but this doesn't allow make it smaller, sorry. The feared Tree who spreads the seeds of insanity and death: Haryon, the Tree of Madness. Thought this MOC can be very simple, don't underestimate it. It can be very hard to build. Here, the 'roots'. The torso was probably the second hardest part to make. It took me a while to twist it well, and add all the Cordak missiles. Upper torso, with an eye and the intestine thing. Head. It has three eyes. Upper head. That brain, ladies and gentlemen, was the greatest pain I suffered as a MOCer. It took me half an hour to make it without to pop off. Grr. Its back, with the third eye and the intestine going around. The articulability is very high, but it's hard to return to the original 'twist'. If it stretches, it's my tallest MOC to date. It's more taller even than Riega or Titan Mata Nui. Now, as the other times, enjoy some pictures of them together. Let's start with the comparation with an Inika build, Lianyu. I don't consider them 'titans': 'Dust' is as tall as Yooran's True End, and Haryon is too simple. Hope the others share the same opinion or I'm doomed. Ninja Carrot: WE NEED TO TALK, L.A!! L.A: Eh? Not now, Ninja Carrot!! Ninja Carrot: YOU HAVE ALREADY POSTED THREE CREATIONS WITHOUT ME! THAT CAN'T BE ALLOWED!! Ninja Carrot: BUT... BUT... PEOPLE MISS ME!! DON'T PUSH ME!! W.O.L.V.E.R Unit: So, now my name is Sehder, and I'm a member of the Order of Mata Nui. I was an Av-Matoran who was destined to transform into a Bohrok and blablabla. Oh, and this is Hok. Say hello, Hok. Sehder: And that's all, I'll guess. I'll leave you with the entries, now I have some missions to accomplish. Hok: F-12. Hit and sunk. A picture of the entries for the contest so far. 'Dust' attacks first! He decides to use a blast of toxins to kill the tree! But Haryon isn't that subtle. Goodbye right arm! Now, last picture, bye bye, all that things. - The Theme: Hunter and Prey. I don't want to say that the other rivals wouldn't be a problem, eh. However, most of you would agree that it's very hard to match him, and more if he got serious like this time. Since I can't match him in building, I have to work on all the other fields I have a chance to beat him: concept, story, and originality at parts design. The story: an agent from the Order of Mata Nui was sent to an island which has been recently destroyed, a post-apocalyptic place where a mysterious tree is killing the survivors. The agent starts hunting the tree, searching for ways of behaviour, weak points... But at the end, the prey turns to be the hunter, guided to a trap since the beginning by the tree. Maybe it isn't as well-developed as Chronos' one on his MOCs, or Toa Striker on the ones from him, but I think I managed to do a good presentation, and the main idea is easy to get. The concept: 'Hunted Hunter' is the main idea for the concept. The weak, organic tree traps and kills the mechanical, powerful hunter. Trees, which are the lowest post on the food chain, are now mutated, disgusting monsters with spikes, tons of eyes, and brain and guts exposed to the atmosphere, which want to kill everything. On the other hand, we have Daure, which now is a massive, bulky machine who was developed for biohazard combat. As far as I know, in a standard post-apocalyptic scenario the air is polluted, and since there's no electricity, people need to use fossil fuels and vapor in order to move. Due that, they need breathening special equipment. Our loved 'Dust' combines both of the idea. �The color scheme? Well, 'Dust' is yellow, similar to the sand and dust (not enough tan or brown); and the Haryon uses the Madness color scheme: the white of bones, the red of blood, and the black of darkness. Originality at the desings: most of you know me due to Etherians; others, due to the End Knight proyect; but I personally consider that my 'special touch' on my MOCs are the surprising use of the parts. In 'Dust', I would say the feet of Stormer XL as jacket, the entire back, and the Kanohi Kori. In the other hand, the most interesting ideas of the Haryon were the Cordak Missiles, the brain, the 'intestine' and the build of something like a torso using only HF 2.0 arm connectors. The picture inspiration for Haryon (may be a bit... disgusting, for someone). Aaaaaaaaaaaaaaand probably I'll say too much here. The best part is that I'm forgetting something... Well, until I realize what I don't remember, that's all. Thanks for watch the MOCs, and for the ones who saw the video and read ALL THE PAGE, a great hug from the Ninja Carrot! Wish my luck!! P.S: link to the contest here. P.P.S: great, Daniel Janei joined the party too. DON'T TOUCH THE MASK!! Well, my favorites are Valkenhayn, Hazama, Bang, and Makoto. I also use Tager, Jin, and Ragna. And yes, I really want to get CP. Quoting NoWhereMan . Well, my favorites are Valkenhayn, Hazama, Bang, and Makoto. I also use Tager, Jin, and Ragna. And yes, I really want to get CP. Makoto is a very charismatic girl, it's a shame she hasn't got a good middle/long-distance attack. And I hate Jin. Very interesting character, great playability, but I don't know why, I hate it xD First of the new chracters to play: Izayoi, Bullet, Azrael or Amane? Quoting NoWhereMan . If you read this, I hope you make many more MOCs in the future, and you finish Negertia's will. Also, who do you main as when you play Blazblue? I don't think I ever asked. If you read this, I hope you make many more MOCs in the future, and you finish Negertia's will. Also, who do you main as when you play Blazblue? I don't think I ever asked. Quoting Gale Winthrope LOL, am I going to enter? As you can clearly see the answer to that is a definite no. Did you not see the other entries?! XD and beyond that, I literally JUST now finished what I've been working on. Still got the BCBS entry to work on too... Hmm... Don't know what I'm going to do for that... Oh well. Still got a few days. Well, my dear, if I entered, you can obviously do it too xD Oh, it's true, the round ends this week...and only one contestant...=( Well, I won't give up. I have to prepare my entry too! LOL, am I going to enter? As you can clearly see the answer to that is a definite no. Did you not see the other entries?! XD and beyond that, I literally JUST now finished what I've been working on. Still got the BCBS entry to work on too... Hmm... Don't know what I'm going to do for that... Oh well. Still got a few days. Yaaaaay! 20 likes! Since August I didn't get a creation so many likes =/ Thanks a lot everyone!!! Quoting Coconut Fanatic Believe it or not... I like Sehder the most. Yeah, you have to love those robots. Daure is pretty epic though, his back is WONDERFUL. It must have taken ages to figure out just how to build it, but I'm glad you did, because it is a sight to behold. Believe it or not... I like Sehder the most. Yeah, you have to love those robots. Daure is pretty epic though, his back is WONDERFUL. It must have taken ages to figure out just how to build it, but I'm glad you did, because it is a sight to behold. Quoting Max W. crap. I totally forgot to enter this. I was gonna do a big hero guy and have the predator be a microscopic insect too... it was so perfect... Anywhoo, nice one. the tree is a little... hard to imagine active. I mean, it IS a tree... but I can see what you were going for. All I have to say about Daure is... Dat Back. Quoting Gale Winthrope A.... Tree..... Ok, then. XD I love the back of Daure, it is just beautiful. The tree is pretty darn awesome as well. I love the curvy and twisted look it has, and the, what I'm going to call brain, section is a great idea. Lovely work L.A.! Totally random and unexpected, right? THAT'S HOW THE MADNESS WORKS!! MUAJAJAJAJAJA!! Thanks a lot, my dear =) Aren't you going to enter? crap. I totally forgot to enter this. I was gonna do a big hero guy and have the predator be a microscopic insect too... it was so perfect... Anywhoo, nice one. the tree is a little... hard to imagine active. I mean, it IS a tree... but I can see what you were going for. All I have to say about Daure is... Dat Back. A.... Tree..... Ok, then. XD I love the back of Daure, it is just beautiful. The tree is pretty darn awesome as well. I love the curvy and twisted look it has, and the, what I'm going to call brain, section is a great idea. Lovely work L.A.! Quoting Daniel Jan�i Wow, man, this is amazing entry. I think that you can be one of that three lucky winners. These two MOCs looks really great. Daure is my favourite. I like the color scheme (yellow and silver-good idea), but my favourite part is his body. His body is really amazing and his back is.....EPIC, EXCELLENT, AWESOME, AMAZING, GREAT..... Haryon is really interesting becouse..... it is tree. But you made a amazing entries and good luck. And what is this: Don�t touch the mask!?!?!?!? Wow, man, this is amazing entry. I think that you can be one of that three lucky winners. These two MOCs looks really great. Daure is my favourite. I like the color scheme (yellow and silver-good idea), but my favourite part is his body. His body is really amazing and his back is.....EPIC, EXCELLENT, AWESOME, AMAZING, GREAT..... Haryon is really interesting becouse..... it is tree. But you made a amazing entries and good luck. And what is this: Don�t touch the mask!?!?!?!? Quoting Banjax 2077 Hmm my schools be filter says the link is explicit art:P Great work L.A. I really like Dust, the tree thing could have been better if the roots were longer but nonetheless amazing work. Quoting Nitherium Realmed Venture fourth infront of these remarkable MOC's path leading them to MOTD (we hope) Great job Miranda! JAJAJAJAJA I wish ._. Thanks! The brain is a simple idea, and however it was the hardest to apply xD Thanks, dear Commander. Your madness moc is especially great, but Daure is good too. That back! Hmm my schools be filter says the link is explicit art:P Great work L.A. I really like Dust, the tree thing could have been better if the roots were longer but nonetheless amazing work. Venture fourth infront of these remarkable MOC's path leading them to MOTD (we hope) Great job Miranda!